When it comes to presenting photography on your website, possessing great imagery is only half the battle. The other half consists of presenting those images in a way that is both attractive and professional. Thankfully, WordPress’ native photo gallery builder is able to organize and display a range of images with relative ease. Even better, you can extend WordPress’ default functionality to present your photos in an even better light. With the above in mind, this post will walk you through the process of creating galleries using WordPress’ built-in photo gallery builder, as well as how to accentuate your gallery using WordPress plugins. This opens the WordPress media uploader, where you can upload and select the images you wish to be included in your gallery. WordPress will then allow you to individually select each image for inclusion in your gallery. By selecting each image, you can add additional information such as a title, a caption, and ‘alt’ text. These configurations aren’t mandatory, but they will help visitors and search engines to identify your images. On the right hand side of the screen, you’ll notice further gallery settings. These configurations let you decide where each image links to, the amount of columns in your gallery, the size of the images, and the type of gallery you want. To finish the process, click the Insert gallery button. This will close the media uploader, and insert the gallery into your WordPress page. As demonstrated above, WordPress does a fine job of putting your photo gallery together quickly and simply. However, if you’d like to go the extra mile in displaying your gallery, take a look at the following options. The tried and tested lightbox feature is a great way to let visitors bring each photo center stage. There are many free WordPress lightbox plugins to choose from, with the best being listed right here on our blog. Furthermore, lightbox functionality comes built-in with all our themes released from 2016 onwards, including Photolog, Optics, and Sider. Functionality includes full-width slideshow galleries with optional thumbnails, autoplay, and zoom effects. Although photo galleries are a great way to display photography, they may not suit your particular layout. That’s where a well-designed slideshow comes in, and WordPress has the ability to produce slideshows without the help of plugins. This simple change converts your gallery into a slideshow, saving you space on your post or page. Alongside WordPress’ bundled lightbox functionality, we also offer our own slideshow plugin for anybody who purchases a theme released in 2016 or later. Finally, we serve up even more gallery garnishing features through our Sell Media plugin. 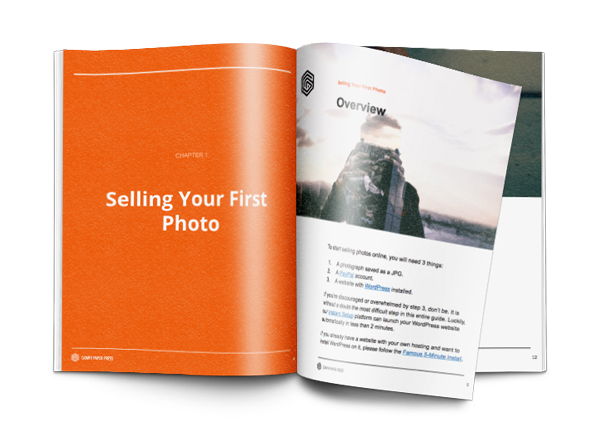 Sell Media rivals other plugins such as WooCommerce, which help you sell photography, prints, and stock online. On top of making it easy to take payments for digital downloads, Sell Media has its own lightbox feature, plus a built-in photo gallery builder, which differs in design from WordPress’ native gallery. You can also password protect certain galleries, to save them for the eyes of paying members only. The benefit here lies in having your gallery and lightbox functionality coming from the same source, rather than from independent sources. This ensures design consistency throughout the presentation of images on your website, making it far more professional. By using the above instructions to implement and beautify your WordPress photo gallery, your images will be presented with the elegance they deserve. Use WordPress’ native functionality to build initial galleries. Embellish those galleries with lightbox functionality. Mix it up with slideshows where applicable. For optimum professionalism, use Sell Media to bring it all together in a saleable package. Do you have any of your own strategies for building and decorating your photo galleries on WordPress? Tell us about them in the comments section below! This entry was posted in Blog, Photography, Tutorials and tagged lightbox, photo gallery, sell media, slideshow. Bookmark the permalink.